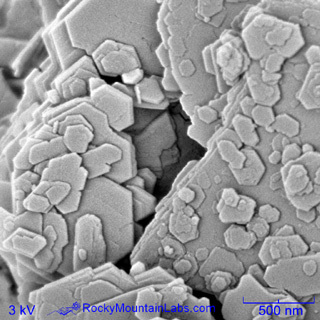 Scanning Electron Microscopy - High-Quality Microscopy In Golden | Rocky Mountain Laboratories, Inc.
Rocky Mountain Labs in Golden, Colorado specializes in scanning electron microscopy to help identify the material composition for surfaces, materials, minerals, coatings, metals, plastics, dust, contaminates, and other unknown substances. With the high magnification and resolution imaging of SEM analysis, we can determine the number, size, and morphology of small particles, providing a wealth of information to support the research of materials, samples, or chemicals. 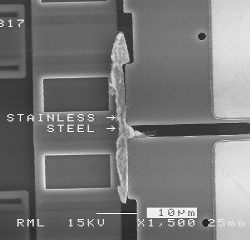 What Is SEM Used For? 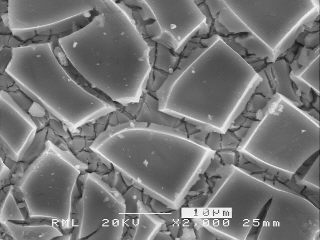 Scanning Electron Microscopy (SEM Analysis) can produce images of almost any sample at magnifications of 15-300,000X. 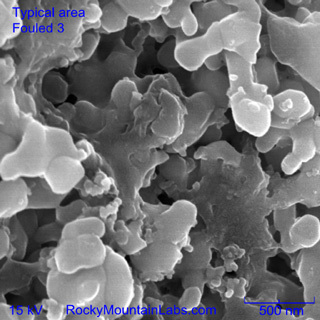 The SEM has tremendous depth of field allowing for imaging that cannot be accomplished using optical microscopy. Conductive and nonconductive samples can be imaged. When operated in the backscatter (BSE) detection mode, differences in material composition can be observed. Elemental analysis can be performed on any feature observed with an integrated Energy Dispersive Spectroscopy (EDS) detector. 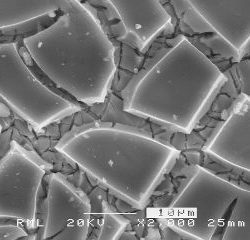 SEM EDS analysis or SEM EDX analysis can be used to provide chemical analysis in areas as small as one micrometer in diameter. 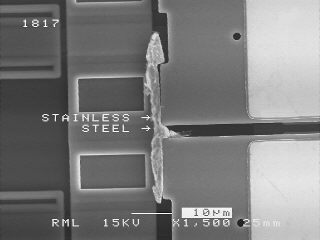 In the SEM, an electron beam is focused into a fine probe and rastered over a small rectangular area. As the electrons interact with the sample, various signals, including those from secondary electrons, are created and detected. These highly localized signals are used to modulate the brightness of a CRT display rastered synchronously with the electron beam. 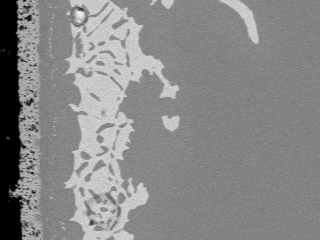 The image formed on the CRT is a highly magnified image of the sample. The technique is usually nondestructive, although instrumental sample requirements often mandate alteration of the sample before analysis. 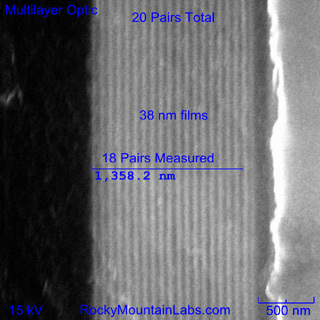 Magnification is from 10X to 300,000X and lateral resolution is 10-50nm, allowing features as small as 100 Å to be seen. 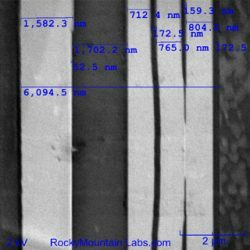 The analysis depth is 20-50 Å. SEM Analysis provides excellent topographical data, and in backscatter mode atomic number information (compositional) also. Images can be e-mailed or delivered on various storage media for client manipulation. 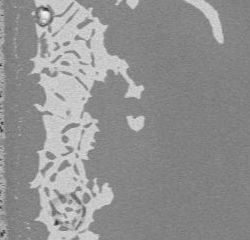 Back-scattered electron (BSE) images are useful for locating phase differences and finding specific features on a sample. When a high energy electron interacts with an atom, it undergoes either inelastic scattering with the nucleus. BSEs result from elastic scattering and leave the sample with energies comparable to the primary beam. The likelihood of backscattering increases with the atomic number (Z) of the material. High-Z materials give a stronger signal (brightness) than low-Z materials, thereby giving image contrast from elemental differences. 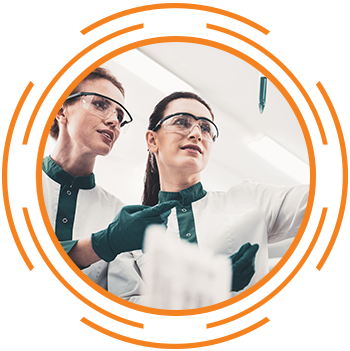 At Rocky Mountain Labs, our team has in-depth industry knowledge across a variety of verticals, including manufacturing, chemicals, construction, healthcare, energy, electronics, polymers, and consumer products. We can help you resolve a plethora of issues, including quality control, and we can increase your understanding of materials for a more efficient application. Our independent surface chemistry and microanalysis laboratory was founded in 1983 to serve the needs of industrial, academic, and governmental clients. 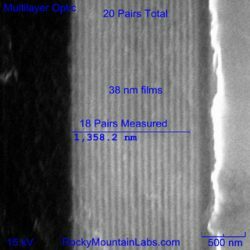 In addition to SEM, Rocky Mountain Laboratories specializes in auger electron spectroscopy (AES), optical microscopy, secondary ion mass spectrometry (SIMS analysis), and more.